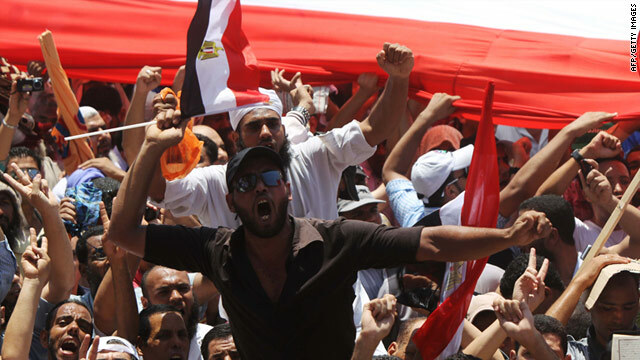 Egyptian Salafists rally in Cairo on July 29, 2011. Clashes between rival Salafist groups have increased this year. (CNN) -- Egyptian military and intelligence officials say they are preparing to launch an operation against al Qaeda cells that have recently been established in the restive Sinai peninsula. While Egypt has seen a number of homegrown militant Islamist groups emerge and dissipate over the past 20 years, none has had clear organizational links with al Qaeda. But senior officials told CNN that al Qaeda cells have now surfaced in northern Sinai, which has seen acts of sabotage and clashes between rival Salafist groups this year. Among the incidents, a gas pipeline to Israel was blown up several times. The focus of their concern is the coastal area between el-Arish, a resort town of about 80,000 people on the Mediterranean, and Rafah on the border with Gaza. "Al Qaeda is present in Sinai mainly in the area of Sakaska close to Rafah," a general in Egypt's intelligence service told CNN Thursday. "They have been training there for month, but we have not identified their nationalities yet." The official said a military operation was imminent "to deter these armed groups." "Units from the 2nd infantry division, with support from general security and the border guards," would take part in the operation, said the secretary general for North Sinai governorate, Gaber al-Araby. "We plan to clean out those criminal pockets around the area of Rafah and Sheikh Zuweid," al-Araby said. A group claiming affiliation with al Qaeda has recently begun a propaganda campaign in the region, according to Egyptian officials. The authority of the state has rarely carried much weight in the Sinai peninsula, where Bedouin tribes have great autonomy. Gen. Abdel Wahab, the governor of North Sinai confirmed that a flier titled "Al Qaeda Sinai Branch" circulated outside a mosque in el-Arish on Wednesday. The document called for an Islamic state in Sinai and announced that the group was planning attacks on the police stations and security forces Friday. "A security cordon has been placed around the entrances of el-Arish and reinforcements arrived outside the police stations and the el-Arish central prison in anticipation of an attack on Friday," said Hazem El Maadawi, an officer stationed outside the North Sinai police headquarters. "Tomorrow is the big day," El Maadawi said, adding that he feared the worst. At the end of last month, seven people were killed in clashes in el-Arish. The clashes began after members of a militant Islamist group called Takfir wal-Hijra stormed a rally being held by another Salafist group outside a mosque. Mohamed Mahmoud, who was among the protesters, told CNN; "The Takfiris stormed in by the hundreds mounted on pickup trucks and motorcycles waving black flags, a symbol of Jihad." "The militants were heavily armed with machine guns, hand grenades and rocked-propelled grenades," he said. "They attacked two police stations and scared the residents under the name of Jihad. We only call for Jihad if someone attacks our Islamic country or people." The head of security in North Sinai, Gen. Saleh al Masry, told CNN last week that Takfir-wal-Higra had become active during the revolution that led to the ousting of President Hosni Mubarak. "The terrorists were joined by members of Palestinian factions and they are currently being questioned by military intelligence. We arrested 12 assailants including three Palestinians," al Masry said. What's not clear is whether the Takfiris are part of -- or aligned with -- the al Qaeda cells said to be training in Sinai. The new leader of al Qaeda, Ayman al-Zawahiri, is Egyptian and before leaving his homeland in the mid-1980s, had similar views to Takfir about overthrowing the Egyptian state and replacing it with Islamic rule. More recently al-Zawahiri has recorded several messages exhorting Salafists in Egypt to take advantage of the ousting of Mubarak. In an audio message that appeared on Jihadist forums earlier this month, al- Zawahiri said: "I commend the heroes who blew up the gas pipeline to Israel. I ask Allah to reward them for their heroic act, for they have expressed the anger of the Islamic Ummah against this continuing crime from the reign of Hosni Mubarak to the rule of the Military Council."